Using low-velocity winds—less than nine miles per hour, which are not strong enough to turn a traditional wind turbine's blades—the new generator creates power using "elastic tension gradient" strips. 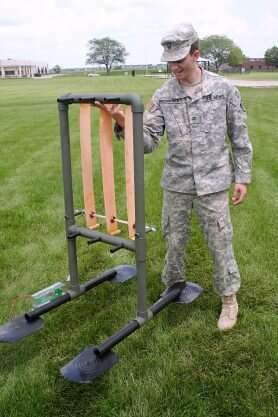 The prototype generator, built at the Corps' Engineer Research and Development Center, has a base structure made of PVC piping that supports eight elastic strips mounted vertically on rotating tensioning tubes. The strips are positioned in parallel with the wind's direction and their front-to-back elasticity gives them a constant serpentine wiggle, which moves an embedded copper induction coil across a smooth pipe containing magnets. Wiring transmits the induced electricity from the coil generators to a power converter and output where it can be used for all sorts of work. Optionally, guide planes can be attached to funnel more air current over the flaps and a stiffening bar can be added to at the midpoint of the elastic flaps, which "enhances the generation of serpentine motion by providing an increased surface area for the fluid without hindering the serpentine motion," according to the patent. The Army's patent lists 10 inventors: Charles Marsh, Axy Pagan-Vazquez, Carl Feickert, Aaron Averbuch, Meredith Sellers, Christopher Joel Foster, Scott Lux, Justin Hesterberg, Andy Friedl, and John Alexander Magerko, III. 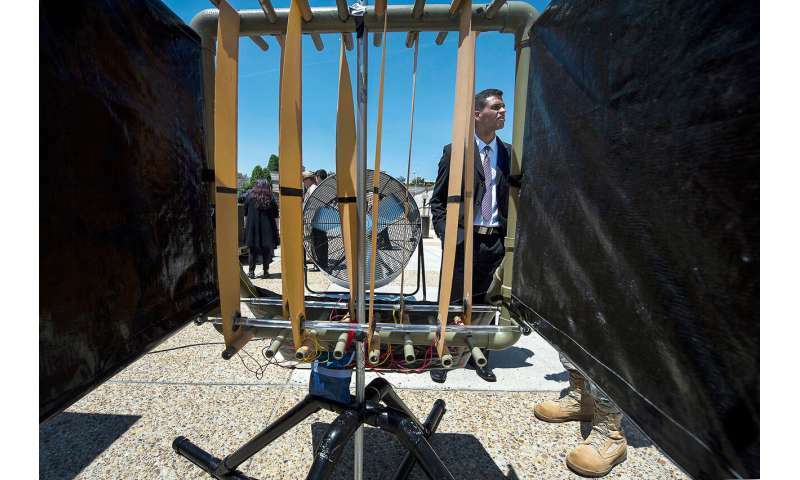 In a 2014 report, Marsh and Feickert wrote that the idea for the fluid generator was initially inspired by "common Venetian blinds, fluttering in the gentle breeze of an open window..."
In coordination with the Army's technology transfer program, Marti Elder, a senior technology manager at TechLink and invention licensing expert, is seeking entrepreneurs or businesses that would make, use, or sell the generator commercially. Elder said that the Corps of Engineers's technology, scaled up, could expand the geographic boundaries of wind energy production to places with historically low winds, and noted that the blade-less design has a reduced impact on birds and bats. "The market for renewable energy isn't going away, and neither is the military's interest in powering expeditionary forces," she said. "With a working prototype, the business opportunity is evident and exciting." As usual, critical details left out: how much power does it generate?? To get some measure of the energy available using the prototype Flutter Mallard, CERL compared the active wind capture area (about 0.65 square meters) required of a typical small wind turbine to that of the combined equivalent areas of several Flutter Mallards operating at low wind velocities ( less than or equal to about 3 meters per second). The Flutter Mallard generated about 3 watts of power verses the equivalent of nearly zero watts for an under powered turbine at these low wind speeds. As the research continues to progress, the team's vision is to replace the vibrating membranes with a highly elastic membrane made out of flexible photovoltaic solar cells. Doing so will capture and store additional available solar energy during the day, which will complement the harvested wind energy. carbon_unit Thank you for supplying that essential information. 3 watts is not bad! I'd also like to know the voltage.